Goodwill will pick up your donations! Goodwill Industries of Central Alabama’s mission is to provide training, vocational rehabilitation and employment opportunities for people with disabilities or other vocational problems, which result in barriers or limitations to competitive employment. Goodwill Industries of Central Alabama has helped people go to work since 1968. We provide employment, job training and other community-based programs for people with disabilities, those who lack education or job experience and others facing employment challenges. 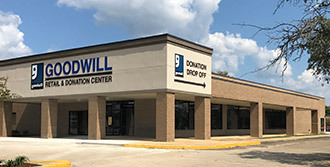 Goodwill has opened a brand new store and donation center in central Montgomery. The new store is located at 2601 Eastern Boulevard, in the old Piccadilly Restaurant location. Store Hours are Monday—Saturday, 9 a.m.—7 p.m. and Sunday, 1 p.m.—6 p.m. Phone number 334-647-1872. Donations are accepted. Donate Stuff. Create Jobs.